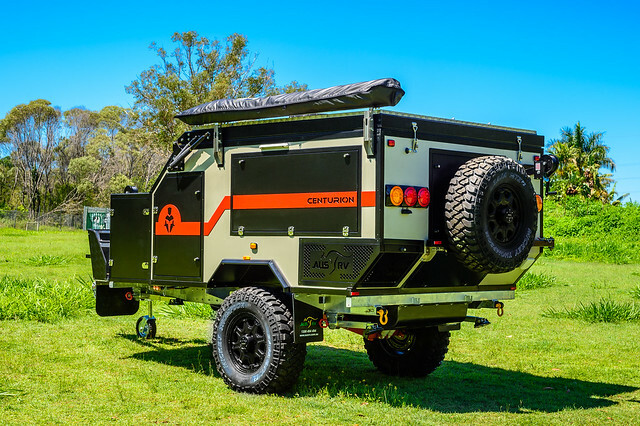 Centurion Off Road Camper Trailer – Fully featured off road camper trailer built tough for Australian conditions. Awning included. Solar and batteries. Stereo, hotwater, slide out kitchen, toolbox, queen size bed, rear lounge and more. Titan 12 – Extreme Terrain Hybrid Pop Top 12 Foot Caravan. Sleeps up to 4 people. Awning included. Internal kitchen and stove. Rear external shower. Solar and batteries. Touch screen stereo. Slide out external kitchen. Queen size bed. 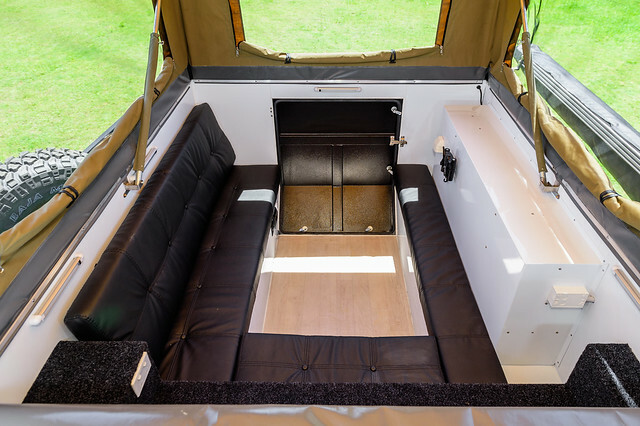 Titan 12 4 Berth – Extreme Terrain Hybrid Pop Top 12 Foot 4 Berth Caravan. Sleeps up to 4 people. Awning included. Internal kitchen and stove. Rear external shower. Solar and batteries. Touch screen stereo. Slide out external kitchen. Queen size bed. Wollemi 17-02-XT (Extreme Terrain) Off Road Caravan – 17 Foot Extreme Terrain Rear Door 2 Adult One Child Luxury Caravan. Everything on the All Terrain models plus the off road pack which includes raptor coating, maxtrax, stone guard, mud tyres and heavy duty independent suspension. 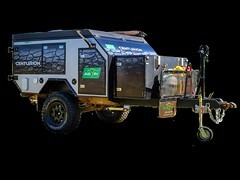 Finke 19-01-XT (Extreme Terrain) Front Door Off Road Caravan – 19 Foot Front Door Extreme Terrain 3 Person Luxury Off Road Caravan. All features of the All Terrain model with off road pack fitted. Includes maxtrax, raptor side protection, tool box, stone guard, slide out kitchen, side bars, heavy duty independent suspension. 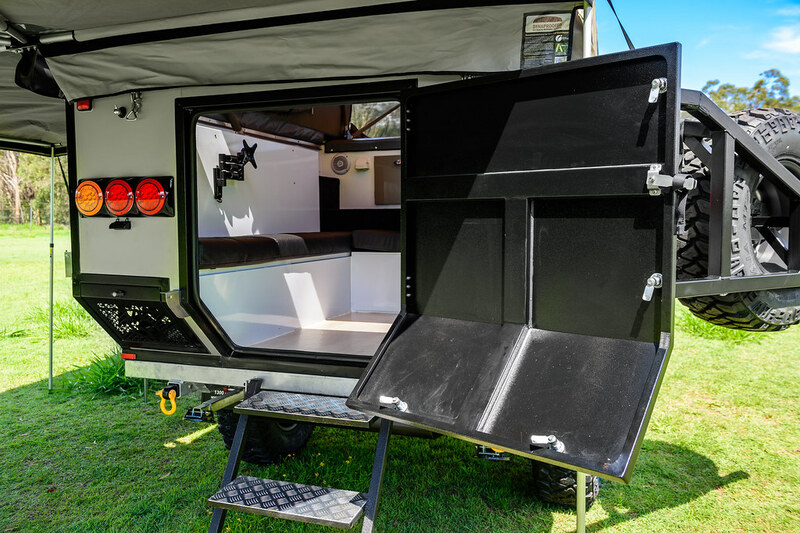 Finke 19-02-XT (Extreme Terrain) Rear Door Off Road Caravan – 19 Foot Rear Door Extreme Terrain 3 Person Luxury Off Road Caravan. All features of the All Terrain model with off road pack fitted. Includes maxtrax, raptor side protection, tool box, stone guard, slide out kitchen, side bars, heavy duty independent suspension. 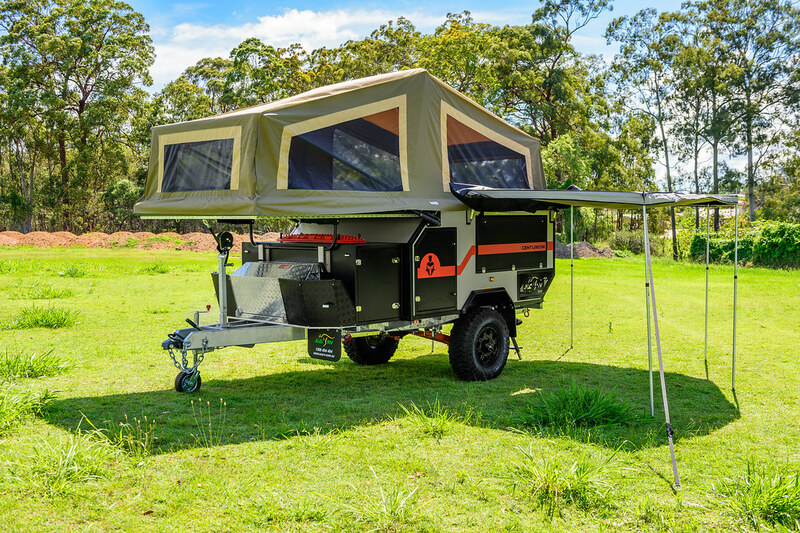 Finke 19-03-XT (Extreme Terrain) Off Road Family Caravan – 19 Foot Front Door Extreme Terrain 6 Person Family Luxury Off Road Caravan. All features of the All Terrain model with off road pack fitted. Includes maxtrax, raptor side protection, tool box, stone guard, slide out kitchen, side bars, heavy duty independent suspension. Byfield 22-01-XT (Extreme Terrain) Front Door Off Road Caravan – 22 Foot Front Door Extreme Terrain Luxury Caravan off road caravan. All features of the all terrain models with the off road pack fitted. Includes maxtrax, raptor side protection, tool box, stone guard, slide out kitchen, side bars, heavy duty independent suspension. Byfield 22-02-XT (Extreme Terrain) Rear Door Off Road Caravan – 22 Foot Rear Door EXTREME TERRAIN 3 Person Luxury Off Road Caravan. All features of the all terrain models with the off road pack fitted. Includes maxtrax, raptor side protection, tool box, stone guard, slide out kitchen, side bars, heavy duty independent suspension. Byfield 22-03-XT (Extreme Terrain) Family Off Road Caravan – 22 Foot Front Door EXTREME TERRAIN 6 Person Family Luxury Off Road Caravan. All features of the all terrain models with the off road pack fitted. Includes maxtrax, raptor side protection, tool box, stone guard, slide out kitchen, side bars, heavy duty independent suspension. Byfield 22-04-XT (Extreme Terrain) Luxury Off Road Caravan – 22 Foot Extreme Terrain 3 Person Luxury Off Road Caravan with Club Lounge. All features of the all terrain models with the off road pack fitted. Includes maxtrax, raptor side protection, tool box, stone guard, slide out kitchen, side bars, heavy duty independent suspension. 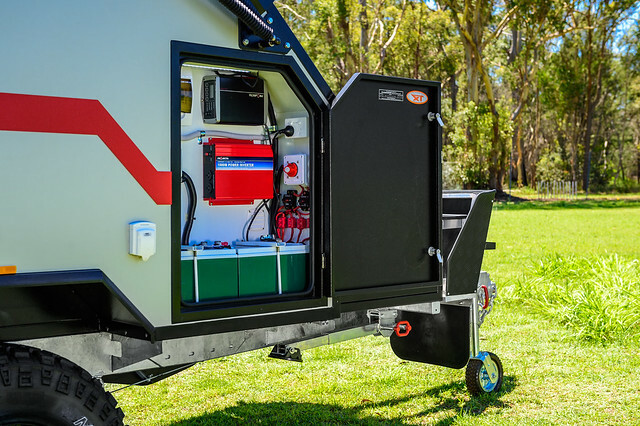 The chassis is all 6” and hot dipped galvanised to give you years of trouble free travel wherever your next adventure takes you. 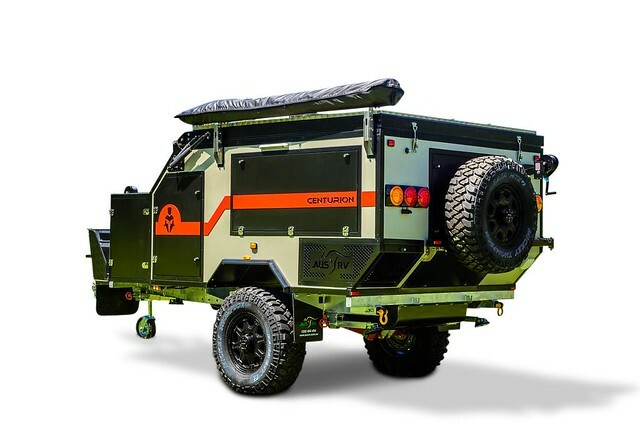 On the front you will find a Vehicle Components DO35 off road hitch with rated safety chains and rated shackles for maximum articulation and safety when off roading. The Projecta is a 35A 7 stage state-of-the-art battery management system designed to charge and maintain auxiliary batteries. There is also a IDC25 9-32v DC-DC charger to manage all of your solar charging. There is a Im1000 watt inverter fitted for standalone 240v power supply when needed and to ensure the highest safety standards all AusRV 240v electrical fit-off is certified by fully licensed electricianslacement. 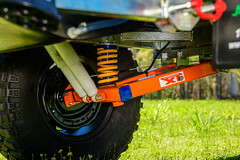 Vehicle Components Cruise Master XT independent trailing arm suspension takes integration to the next level by utilising high quality shock absorbers, Australian Made 4x4 style coil springs and automotive grade maintenance free bushes. All components are integrated seamlessly to ensure you enjoy optimum comfort, load carrying capability and handling characteristics across a variety of terrains. Outside you will multiple integrated compartments for maximum storage. There is a large slide out kitchen with a three burner gas stove, sink with hot and cold running water and fridge slide. The Truma 14lt hot water system is also an integral feature of the exterior and with 2 x 85lt poly water tanks you will have ample water capacity for nice long hot showers. 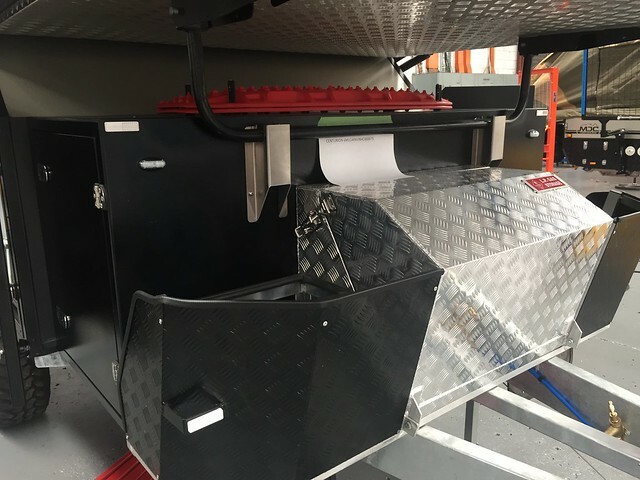 Towards the front there is a massive lockable tool box area for all of your equipment protected by a stone guard with a lockable box inclosing 2 x 4.5kg gas rings. All AUS RV gas systems are built to strict Australian design rule standard and certified by a licenced gas fitter with certificate supplied. It is a very easy set up only taking moments to be ready for you to enjoy. The front and rear winch system make this process a one person setup process and with dual gas struts to assist you this is an effortless process. Also providing protection from the elements is a Supa Peg Batwing awning. 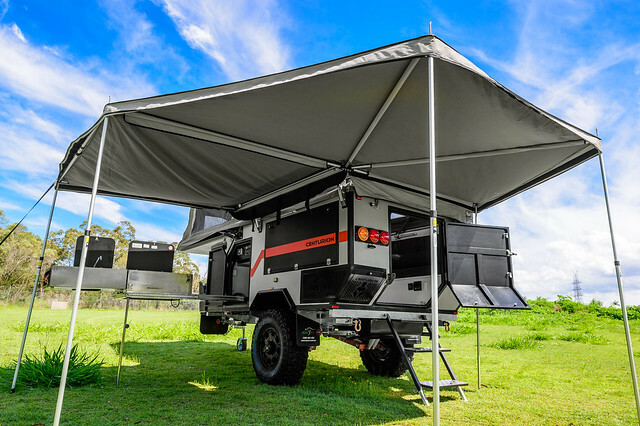 The Batwing awning give you a huge area of protection in all conditions and is set up in only moments. .